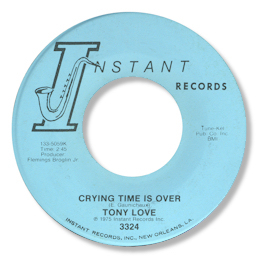 When I first met Instant label owner Joe Banashak in New Orleans in the early 70s one of the 45s he had the highest hopes for was Tony Love’s “Crying Time Is Over”. Sadly despite some local radio plays it bombed, not least because Banashak himself was sadly running out of steam - Instant records folded not too long after this 45 was released. But getting on for 40 years later this tuneful midpacer has been rediscovered and is getting it’s due attention from the dancers. I have a soft spot for it too, especially Tony’s strong vocal and the excellent harmonies behind him. 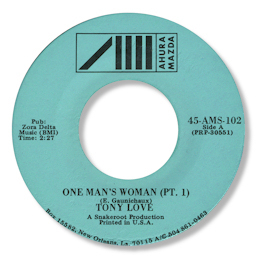 I’m even more impressed by Love’s two parter “One Man’s Woman” for Scott Johnson and Parker Dinkins’ NOLA based Ahura Mazda concern, which is probably best known for the country blues of Robert Pete Williams. Love sounds really forceful here and the arrangement particularly the big horn section are right up my alley. Great to hear the Crescent City pronunciation of “hurt” as “hoit”! Note ~ The Tony Love on Ham-Sem is a different artist.